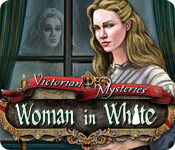 Victorian Mysteries: Woman in White is rated 3.5 out of 5 by 40. Rated 4 out of 5 by methosfl from Could have loved it but... I actually really, really liked this game. The scenery was beautiful, the HOG's were pretty challenging, the mini games were ultimately easy once you figured out what your were supposed to do. It was the figuring out that was the challenge! I thought the hint button took awhile and I ended up muting the music about half way through because it started to get on my nerves. Great story-line, if not a bit convoluted, but that too just made you think. Technically the voice overs were glitchy, cutting out or not playing all together, but there was also script so to me it wasn't a big deal. There were lots of different scenes to explore and 2 different Victorian manors and I thought that was really cool. The reason I can't give it 5 stars is because I was really, really enjoying it, really getting into it and BAM, it was over. It wrapped everything up, but in voice overs, and I was left feeling "but, but, but!!!" It only took a few hours but I did buy it as a daily special so definitely worth that money, probably not the full price. Has the potential to be great if they just fleshed it out and expanded it. Rated 4 out of 5 by triiv from A game I hated to Love!? This was a game that was very frustrating for me but, I savored it and the outstanding storyline. The storyline was exceptional, other than appearing to be truncated in certain areas. The play on interaction with differing personalities gave it a touch of mystery often lacking development in similar games. If the original story led to a sequel, I would buy it as soon as I could (hopefully with more clarification)! The weaknesses of the game came in failure to take more advantage of this fascinating story to flesh out something no less than a five star game. Characters were sometimes too transient as they would come on the scene and leave without further explanation (though all characters seemed to add to the storyline). The most frustrating of all was failure to provide a hint as to how to tell what the ending point of the mini game should be. Additionally, the hints I normally use if I cannot determine where to go or what to do next would, in this game, usually point me back to the problem that had stopped my progress and would not give any explanation. Since I cannot give three and a half stars, I will give this four stars. For any of you that may plod along at times, like I do, you may want to go ahead and open the walk thru for use as needed to avoid what would normally be slight inconveniences. With all of this said, I highly recommend this game! Rated 4 out of 5 by RevKellie from A Story with a Game This is one of those times when instead of it being a game, with some story attached, this was a story - with a game attached. The story takes front and center here - good news - as it is an interesting story with twists, turns, villians and heroes. Music is fine, not distracting. Graphics are a bit simplistic and murky but fit the story/scene. Puzzles are easy to medium and fit the story as well. HO Scenes are murky with many objects blending into the bleak background. The Hint recharges maddeningly slow (even on casual) and so a lot of time is spent clicking around the dark junkpile (the click takes a spin after the 5th wrong click). Best use of the Journal I've seen in some time - showing the family tree. Also good, after the game is won, you can hit "Secrets" and go back and review the whole story and pick up any character or idea you missed. I enjoyed the game and would play another in this series - however a little more clarity would definitely be easier on the eyes. Rated 4 out of 5 by Firehorse66 from Good story, good game The story line was great, the graphics not so great. Muddy, cluttered and sometimes too dark HO scenes. But it was a fun linear adventure with lots of interesting places to go and intriguing characters. Definitely worth the Daily Deal! 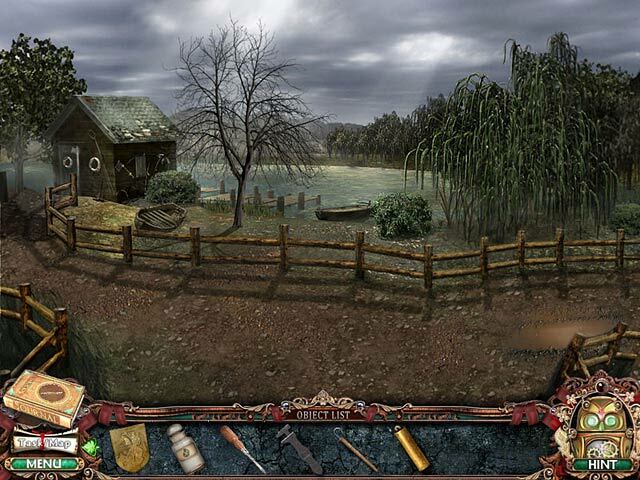 Rated 4 out of 5 by rosekaufmann from Good Mystery Completed game. Intriguing mystery – heard it was based on an actual book. (Caveat: I just love mysteries and read at least one a week.) Nice to have a game without dilapidated houses, ghosts or portals. Visuals were nice. Quite a few locations with some going back and forth. However you could easily figure out where you were going next and the pathways between the locations weren’t too complex. Some of the locations were only used once or not at all except as a pass-through. None of this took anything away from the game. Really liked the ending – all but one loose end was wrapped up. Game was fairly short – didn’t time it, but I’d guess 3 hours at most. Game was more of a story than a straight HOG. There were a fair number of HOGs spread throughout, and it wasn’t particularly difficult to find the items. As far as I was concerned, there was one irritating con: sometimes the exact location had to be clicked whether it was in a HOG (ex: could collect glasses only by clicking the right but not the left lens) or using the inventory items (ex: weights had to be put at a particular point, which wasn’t always the obvious one, on a clock). You just have to click around sometimes, risking the appearance of a whirling cursor. Voice overs were nice; you could determine what questions to ask certain characters, and you could follow the written dialogue as they spoke if you disengaged the sound. You automatically got a message that there was nothing to do in a location. 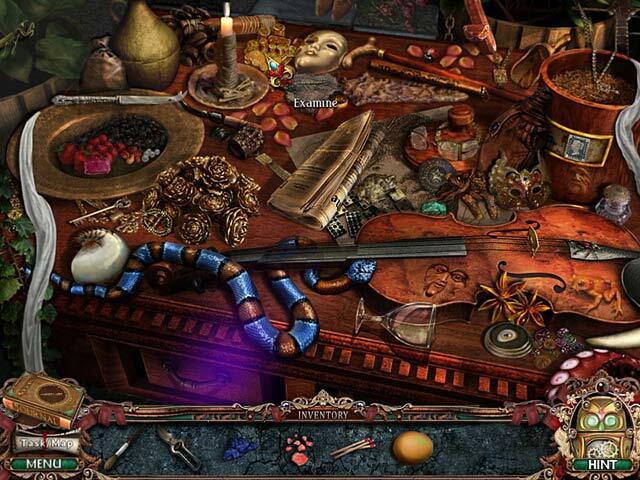 Rated 4 out of 5 by GrrlScientist from engaging but not difficult in this hidden object game, you are Walter Hartright, an artist who finds himself in the middle of a mystery after accepting a job in a Victorian mansion as a private art teacher. it seems that where ever Walter goes, an elusive "woman in white" inexplicably pops up. why? who is she? graphics: not as nice as i'd like since small items were difficult to see. the mini-games and puzzles were interesting and required some thought but weren't super-challenging. music: repetitious but not annoying. my interaction: one hour demo mode, casual play (there's two modes). the characters and the story are presented in such a quietly interesting way that i am now genuinely curious to know more about the woman in white and what her connection is to Walter -- and i am especially curious to how this game ends. Rated 4 out of 5 by Pearly11 from Nohthing like a good old Victorian Mystery I bought this game when it was first launched here on BFG and really enjoyed it. Compared with the modern games of this genre, I'd describe it as 'Soft Adventure HOG'. The game gives a feel of Victorian times. For some times when I think Victorian, I think: "Grey, Black, White, Braun, Rain, Mourning, Desperation, Murders, Mysteries". Not necessarily in this order, but this collection of words pretty much reflects what I associate with the term and so do graphics and sound. But that is not a bad thing as both elements of the game really go well. It's been a while since I played it, but I remember the HOG scenes being ok what concerns visualising items, but I remember coming across some items that I really couldn't make much sense of, such as "3 Face". I was wondering back then if this was a translation issue, but I don't think it is. My feeling is they have used some words and terms from Victorian times we today no longer really use nowadays and this made it all the more interesting for me. There are two difficulties (Casual and Expert), but be warned that playing in expert mode it takes a looooooooooooong time for the hints to recharge in this one. There are some elements going into the Adventure HOG / IHOG genre we so often find with the modern games. But the game seems to be from the time when the transition from straight HOG to a more adventurous game play took place. So you'll need to unlock a few doors and solve a few puzzles, but nothing like in the more recent games. It has voice overs and the story line is well written. I can highly recommend this game and especially for the price of today's Daily Deal, but I would advise to try it first. Rated 4 out of 5 by jmcbeauty from demo only This was not a bad game. I liked it. The storyline was slow to get started and finding the objects were relatively simple to find. I particularly disliked the arrow with the hand or magnifying at the backside of the arrow and trying to decide if I had it in the right place. Following where to go next was nice and I also liked the "there is nothing left to do here" acknowledgement. I will probably buy it at some point in time. Rated 4 out of 5 by NuttySquirrel86 from The Woman in White As with most games now it seems that designers have jumped on the bandwagon as far as the opening scenes go i.e a stormy night. I played the game in casual mode and found that the hint and skip system filled at a moderate speed, though there is not much need to use them during game play. There is not much tooing and froing as the game seems to be seperated into the different areas. The HOS were pretty clear though i found that some of the objects were a little too small so i had to use a hint on a few occasions(considering i also wear glasses too). There dont seem to be many puzzles at all through the game but the ones they do have are not too difficult and also vary. The storyline itself is consistent all the way through and the plot unravels quite nicely at the end as the story is concluded. Rated 4 out of 5 by Juju38 from Not Bad! Great storyline, loved the music too but the HOS were a bit frustrating because they're not the best graphics by a long shot! And not very long play for the price, took me 1hr and 20mins to complete!...i'd recommend buying this game in the sale, would be worth the price then i think. Rated 4 out of 5 by tilmalene from Entertaining Love the game, maybe some locations is not as bright as it coul'd be. Rated 3 out of 5 by MSecaur from Could have been so much better... "The Woman in White" is a fun, easy game, but it is WAY too short! I haven't played scores of these types of games, but I was surprised by how quickly I finished this one. The puzzles and searches were engaging, but there just weren't enough of them. Ditto for locations. As someone who knows the original Wilkie Collins novel really well, I enjoyed how closely the game followed the Victorian time period as well as the original storyline, right up until the end: a secret passage under the house that leads to the asylum? Seriously? When it only took five clicks in another game to get from a country house to a train station miles away, I just don't get why they couldn't have spared the implausibility and let you travel to London instead. And the M. C. Escher-type labyrinth was just plain weird. Also, knowing the book as I do, I know they could have made the game a smidge longer. My biggest complaint was that the end felt rushed, and left more to cutscenes than actual gameplay. Oh well. While the graphics were fairly good and the voice-overs top notch, I would have liked some more interactivity between certain characters, rather than just watching them in cutscenes. Overall, if you like Adventure/Hidden Object games, this is a fun game, if not the best I've played, but if you know the original story, you might be a little disappointed. Rated 3 out of 5 by Tangerine725 from Don't buy this game---unless Read the Forum first. This game still has all kinds of technical problems. Apparently the game has been around for years, and they still haven't fixed it. I did the trial, liked it and bought the game. The first time through, I had just entered Blackwater Park and closed the game. When I reopened it,I was back at the beginning of the game, but everywhere I went said, "There's nothing more to do here". I couldn't even get out of the house. I started the game again with a new player name. This time I got as far as the cemetery, and it wouldn't let me get through the gate. Okay, I started again with another player name. This time I completed the game, but I played it through without stopping. It could be a very enjoyable game. The story is interesting, and I wanted to see how it ended. The Victorian graphics are lovely, especially the rooms in the houses. 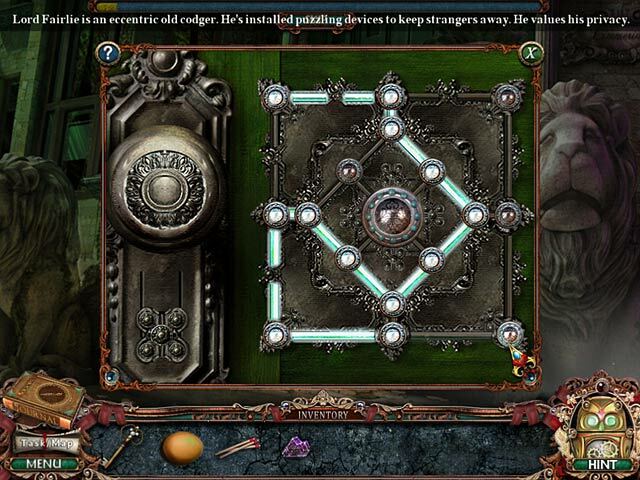 I had to use the hint button more than I wanted to for the hidden objects, but the puzzles were fun. The sound was okay as far as the music goes, but the voice overs needs work. At times, I could barely hear what was being said. In closing, I'd like to tell the Developers and Big Fish to clean up their act (game). You take people's money and you've had long enough and plenty of complaints. I've learned not to base my decision to buy a game on these reviews. That's the reason I put my comments here and not in the Forum. Rated 3 out of 5 by Dr_Q from Based on the Wilkie Collins' novel of the same name He also wrote "The Moonstone." The plot follows the original fairly faithfully. Rather clunky. Old-style graphics. The off-set pointer made it difficult to know exactly what was being examined or picked up. Not too much backtracking. Puzzles were not at all difficult; in fact, some were almost insultingly easy. The fishing game -- I never could get the hang of that, and it felt out of place, as if the developers had a routine they didn't know what to do with, so they threw it in here. The ending is abrupt, even for these kind of games. What kind of drawing teacher goes around smashing and breaking and dissolving half the house? Might be a good game for a beginner. Rated 3 out of 5 by RhoseRhed13 from A few frustrating issues While the graphics are really nice, there were several puzzles with no real explanation of what you were supposed to do. I like puzzles, even hard ones, but I'd like to know what I'm trying to accomplish. If I don't know the rules or the object of a puzzle, I have very little satisfaction if I stumble across the answer. I want to feel like I figured it out instead of just got lucky. On a couple of occasions, information randomly appeared in my journal - useful information, but information that I had not discovered in the course of play. Where did it come from? I really think all necessary information should be encountered in the game play. There were periods of waiting for the game to load the next scene. I play lots of these games and this is unusual. If it hadn't been for the beautiful graphics, this game would have gotten a lower score for the sheer unnecessary frustration and somewhat contrived plot line. Rated 3 out of 5 by greengem418 from Not for advanced players This can be a very relaxing game for beginners, but super boring for advanced players. Items were too easily accessible, and puzzles were very simple. I found the storyline utterly boring, and from the hour demo, it did not capture my interest at all. I would get this game only if I got it on sale, and will play as a very casual game, otherwise, not worth full price, or a game credit for me. Rated 3 out of 5 by Mrs_Kim from Woman in White I think this game is made with the same company that made Moonstone? However I like the latter game better. The game graphic is not that great. The 'woman in white' expression is the same throughout, looks like it is copied and pasted. The puzzle is not that challenging and the storyline is a bit weird. To me it's just an ok game. I recommend you try the demo first before buying. Rated 3 out of 5 by adragon from Load Times use up free time To initially get into the game, it takes over 30 seconds to main menu then about 10 more to start; each time you come back the owl flying sequence of 30 seconds repeats so, if you are not going to play all the free time to check it out, you lose a lot on loads. Internal load times run 5-10 seconds and there is some lag time between scenes. In 15 minutes of play I only encountered 2 true HOS the rest were objects like eggs scattered within the scenes and mini-games with a lot of back & forth from room to room. I am glad I know colors otherwise asking me for manganese, cobalt, cadmium, etc. would have used up the very slow reloading hint button. It could be good for beginners who know to mouse around a lot to find the hot spots. Rated 3 out of 5 by jensapp from Glitchy game! My daughter and I played this game. It started out great, but if you accidentally clicked out of the game, it takes you back to the beginning! It usually happened after we reached the second chapter, and there is no way to get back to the second house without doing everything over again! After the second time it happened, I scrapped the game. Rated 2 out of 5 by aroda44 from NOT GOOD! IM SO glad i only played the trial version. I think the game had an error for me. I was trying to put the fishing reel together and it wouldnt let me. I finished everything in the other spots like the garden etc, but it still wouldnt let me put the pieces onto the reel. I know I had all the pieces. And the owl hint button only lets you get a hint when it wants to . Half the time hes sleeping. Its annoying. I was really un impressed with this game. The graphics were great but everything else didnt make any sense. I had to go way back to the outside to get another paint jar. Took me forever to find these things. Im glad i didnt purchase this game. I dont like that this game doesnt give you the option to go and click a place on the map and it will take you there. One of the last games i played has that option, and it really saves you from having to go to the screen and click next place or next room all the time. Ya so not a great experience with this game. Id like to see a better victorian based game. Rated 2 out of 5 by AverageSizeFish from Tedious exercise in frustration and boredom The graphics are a little blurry as is expected of a game of this age. The sound track has decent music but also includes an annoying little violin noise you hear whenever you click on something and that got old very quickly. The story is not innovative and it moves along at a glacial pace. Unfortunately, at times you get one of those dialogue boxes with sentences to choose from in order to "talk" to another character. It doesn't matter which you choose because, in order to get the full discussion, you have to click them all eventually. And, of course, if you don't this won't affect the outcome of the game. So this is just a pointless, time-wasting exercise that makes you feel a little silly for participating in it. What made me really come to dislike this game though was the very poor puzzles with their ancient clunky interface and lack of a skip button. If I don't like a puzzle and want to skip it then I don't like the puzzle and I want to skip it. If a developer forces me to either do the puzzle or quit the game then I'm going to quit the game. That's what I did with this game. The HOS are also annoying in that you get things on the list that don't look like what you eventually finally click on by accident trying to find them. Add in a very slow load time between scenes and a tendency to take a single task and focus the game on it for far too long and you have the makings of a truly tedious exercise in frustration and boredom. Rated 2 out of 5 by Silversprite6646 from Not yet for Kindle Fire HDX but worth playing on other devices I had a ton of problems with the game on my Kindle Fire HDX. The reviews & game page all stated that the repairs had been made and if you have any problems, just remove and reload. I reloaded AND reset my player 3 times each and still had no journal and no visible inventory. Each time I wanted something from inventory I had to go through it blindly and found that items move around each time you touch them. Saying all that, the game was interesting and fun or I would never have paid the full price to keep playing. The HOSs were fun, not challenging, but OK. I liked the mini games. But most of all the story. It is worth playing IF your game functions properly. Of course I played the whole game with problems, but had to go to the walk through for certain hints. I guess that alone tells you a lot of the game or about me, laugh! Rated 2 out of 5 by gimar from Waste of money Bought this game but it was waste of money. It played out really quick and then nothing else to do. Finished in 2 days. Rated 2 out of 5 by jms424 from Yikes It could have been good. Cons: penalty clicking, puzzles you could not skip, short, could not skip opening scene, hint refill was way too slow. Pro: pretty good story thus the 2 stars and some nice scenery. Rated 1 out of 5 by sassy_brat from Not very good for two reasons... I finished this game in less than an afternoon, and it wasn't very challenging. And, one thing that I do not like in any game is if the Hint takes me to an area and I don't have whatever it is I need to complete the task or the task has already been completed and the Hint takes me back to a completed task. This game does both. I would not purchase this game again if I had to do all over. Rated 1 out of 5 by designermom from Too many glitches! -- takes the fun away. Too many things wrong with this game. For example, you click on the hint button and it shows you where to go... only you cant go there because you haven't finished doing whatever needs to be done where you are. Why doesn't the hint help with what needs to be done first? AND: Hint takes forever to recharge, and is useless anyway. It shows you an area where there is something to do.. even if you don't have the right object in inventory to do it. ..or the problem above. It has not helped me ONCE! Penalty for clicking after only a couple of miss-clicks in the HO, even on casual mode. And some of the items are so hard to find, guessing is a must. Games have the ''skip" button and instructions active, so it looks like you have all you need to play the game -- only you don't . :( Loading time for everything takes way toooo long. The SAME music every time you click an active area gets annoying.. to me anyway. I understand its an older game, but the glitches should be fixed if they continue to sell it. If I could return it for a refund I would. Rated 1 out of 5 by crisgori from Disappointing Another game in slow motion, no full screen and sparkles even in advanced mode. The graphics are ok.